The cable-stayed bridge will be built using a design-build-finance model. Fraser Crossing Partners - SNC-Lavalin Capital, Acciona Infrastructure Canada, SNC-Lavalin Constructors (Pacific), SNC-Lavalin, Leonhardt, Andrä und Partner Beratende Ingenieure, Hatch Corporation, EXP Services. 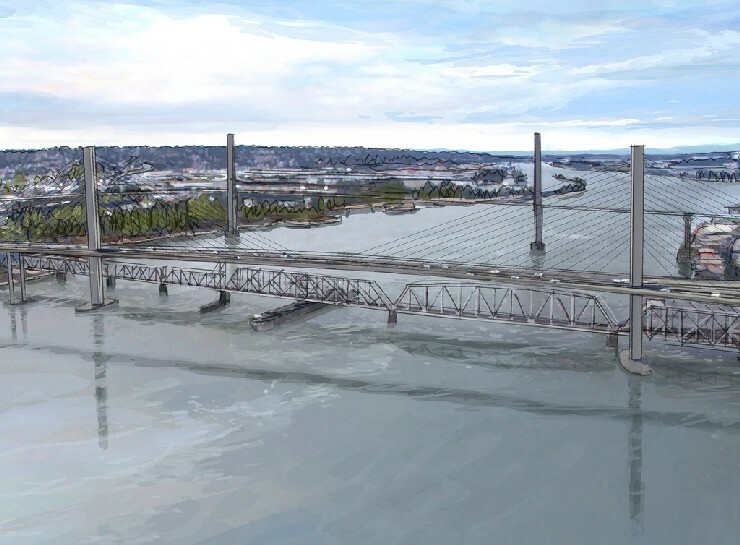 The project involves building a new four-lane crossing to replace the existing Pattullo Bridge. It will have wider lanes and better connections to road networks on either side of the bridge, helping traffic flow more efficiently. The new bridge also features dedicated pedestrian and cycle lanes separated from traffic by a barrier on both sides of the bridge. The project will be funded and owned by the Province of British Columbia. It will be delivered on behalf of the province by the Transportation Investment Corporation, a Crown corporation. The bridge is expected to open in 2023.